LAKE FOREST, CA – February 5, 2015 — Cryoport, Inc. (CYRX) today announced financial results for its fiscal third quarter and nine months ended December 31, 2014. “The momentum in our business is undeniable as we report another quarter of strong revenue growth and gross margin expansion. Revenues for the third fiscal quarter and first nine months of fiscal 2015 were the highest in our company’s history,” stated Cryoport’s CEO, Jerrell Shelton. 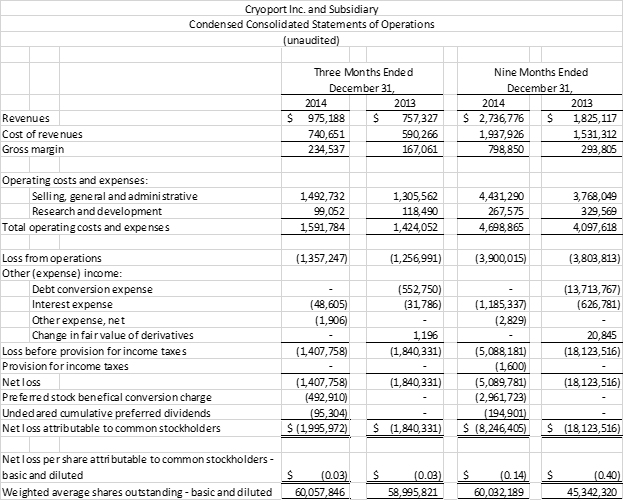 Cryoport’s net revenues increased 50% to $2.7 million for the nine months ended December 31, 2014, as compared to $1.8 million for the same period last year. The increase was primarily driven by growth in overall demand within the Company’s existing client base and the addition of new clients using Cryoport Express® Solutions as compared to the same period in the prior year. Gross margin for the nine months ended December 31, 2014 was 29% of net revenues, or $0.8 million, as compared to gross margin of 16% of net revenues, or $0.3 million, for the nine months ended December 31, 2014. The increase in gross margin illustrates the operating leverage in the business model as revenue continues to ramp. Net loss decreased by 72% to $5.1 million for the nine months ended December 31, 2014, compared with a net loss of $18.1 million for the nine months ended December 31, 2013. The net loss for the fiscal year 2014 period included a debt conversion expense of $13.7 million. Net revenues increased 29% to $1.0 million for the three months ended December 31, 2014, as compared to $0.8 million for the three months ended December 31, 2013. The demand for cryogenic logistics solutions in the life sciences industry and an increase in the Company’s client base were the main contributors to the growth. Gross margin for the three months ended December 31, 2014 was 24% of net revenues, as compared to 22% of net revenues for the three months ended December 31, 2013. The increase in gross margin was primarily due to the operating leverage in the Company resulting in improved economies of scale as revenues increased. Net loss decreased by 24% to $1.4 million for the three months ended December 31, 2014, compared with a net loss of $1.8 million for the three months ended December 31, 2013. The Company expects revenue for fiscal year 2016 to be between $10 million and $12 million. “We know that all the ingredients are present for explosive growth for Cryoport. As government regulations on shipments of biomaterial become increasingly more stringent and prevalent, we expect the growth in demand we have been experiencing will accelerate. In the past two years, our addressable market has doubled in size and our pipeline is stronger than at any time in the company’s history. With an expanded sales force under the leadership of Dr. Mark Sawicki, our newly appointed Chief Commercial Officer, and through our partnerships with the world’s top three shipping companies, we have the ability to capitalize on our market leadership position and deliver exceptional value for our shareholders,” concluded Mr. Shelton. An archive of the webcast will be available approximately two hours after completion of the live event and will be accessible on the Investor Relations section of the Company's website at www.cryoport.com for a limited time. A dial-in replay of the call will also be available to those interested until February 12, 2015. To access the replay, dial (877) 870-5176 (United States) or (858) 384-5517 (International) and enter code: 6985389. 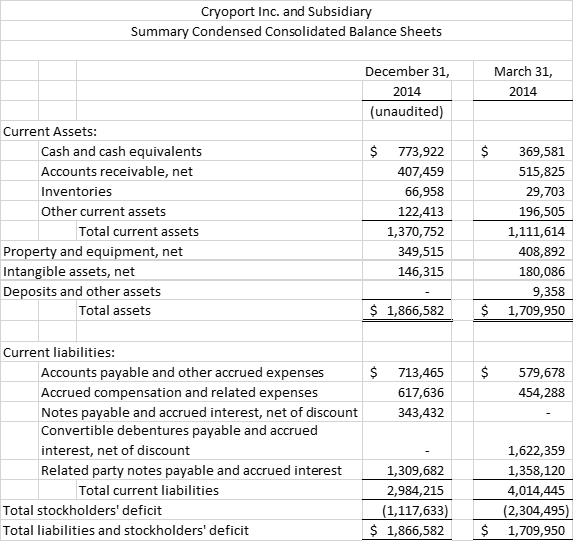 Further information on Cryoport’s results are included on the attached condensed consolidated balance sheets and statements of operations; further explanation of Cryoport’s financial performance is provided in Cryoport’s quarterly report for the quarter ended December 31, 2014 on Form 10-Q, which was filed with the SEC today. The full report is available on the SEC Filings section of the Investor Relations section of Cryoport’s website at www.cryoport.com. Cryoport is the premier provider of cryogenic logistics solutions to the life sciences industry through its purpose-built proprietary packaging, information technology and specialized cold chain logistics expertise. We provide leading edge logistics solutions for biologic materials such as immunotherapies, stem cells, CAR-T cells, and reproductive cells for clients worldwide including points-of-care, CRO’s, central laboratories, biopharmaceuticals, contract manufacturing, health centers and university research. Our packaging is built around our proprietary Cryoport Express® liquid nitrogen dry vapor shippers, which are validated to maintain a constant -150°C temperature for a 10 day dynamic shipment duration. Our information technology centers around our Cryoportal™ Logistics Management Platform, which facilitates management of the entire shipment process. Cryoport is the preferred cryogenic logistics solutions partner to the world’s largest shipping companies controlling more than 85% of the world’s air shipments. For more information, visit www.cryoport.com. To download Cryoport's investor relations app, which offers access to SEC documents, press releases, videos, audiocasts and more, please click to download from your iPhone and iPad or Android mobile device. Statements in this press release which are not purely historical, including statements regarding Cryoport, Inc.’s intentions, hopes, beliefs, expectations, representations, projections, plans or predictions of the future are forward-looking statements within the meaning of the Private Securities Litigation Reform Act of 1995. It is important to note that the company's actual results could differ materially from those in any such forward-looking statements. Factors that could cause actual results to differ materially include, but are not limited to, risks and uncertainties associated with the effect of changing economic conditions, trends in the products markets, variations in the company's cash flow, market acceptance risks, and technical development risks. The company’s business could be affected by a number of other factors, including the risk factors listed from time to time in the company's SEC reports including, but not limited to, the annual report on Form 10-K for the year ended March 31, 2014. The company cautions investors not to place undue reliance on the forward-looking statements contained in this press release. Cryoport, Inc. disclaims any obligation, and does not undertake to update or revise any forward-looking statements in this press release.